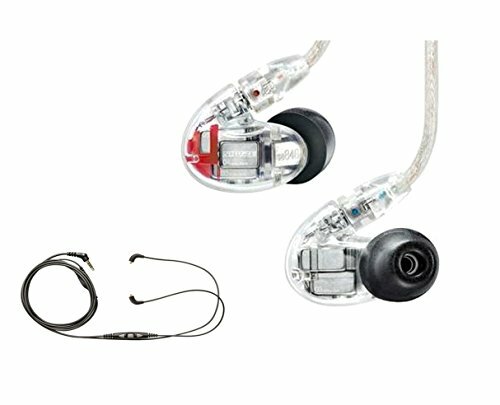 Package Includes: 1 x Shure SE846 (Clear) 1 x Shure Earphone Cable Shure SE846 (Clear) Quad High-Definition MicroDrivers, the SE846 delivers extended high-end clarity and unparalleled low-end performance. ; Evolved from personal monitor technology road-tested by pro musicians and fine-tuned by Shure engineers, the SE846 features a patent-pending design that includes a groundbreaking low-pass filter. This technology enables the deep low-end performance of a true subwoofer without sacrificing clarity or detail of mids or highs. Customizable frequency response, detachable cables, and a wide variety of accessories ensure an ;unequaled, perfectly tailored listening experience for the most discerning audio enthusiast. Shure Earphone Cable The Remote + Mic Accessory Cable (RMCE) optimizes Shure SE model Sound Isolating Earphone (SE215, SE315, SE425, SE535, and SE846) for hands-free use. An inline remote and microphone offer control of key mobile device functions and media playback in a rugged 50” Kevlar-reinforced cable.